I found that I had a gap all around the wheel wells, so after assembly of the wings I filled it in using Aves epoxy putty. Aves putty is similar to Milliput, but easier to work, and also can be thinned and feathered with water if done before it sets up. I used Aves two part epoxy putty in the joints, followed by a couple of layers of Mr. Surfacer and some sanding and rescribing of panel lines. How many times must I relearn the obvious? Check the fit of major components before gluing them up! With all that done, I also added new cannon bay covers from Ultracast, and I also cut away the kit elevators and added Ultracast ones in the dropped position. As you can see in the pictures, I usually paint the upper canopy frames (using a complete Falcon vacuformed unit this time) of the fixed sections and glued them in before painting. When I mask off the cockpit, I mask and paint the lower frames at the same time, starting with the interior framing color. 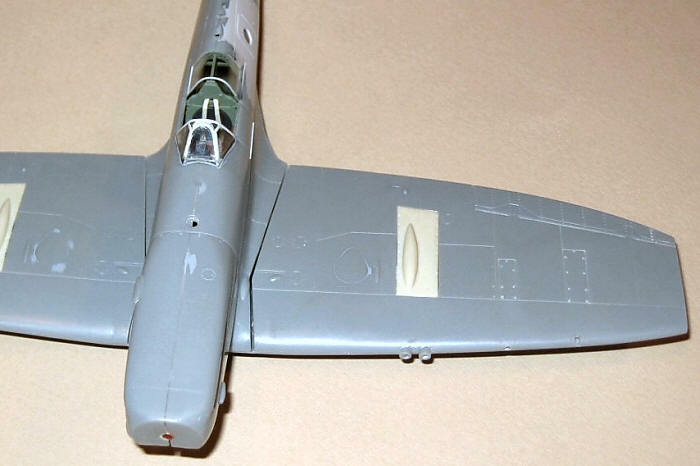 By the way, please note that the kit rudder was fixed cocked slightly to the left, making the elevators look over-drooped in the following picture. With all the major work done it was off to the paint shop. I decided to try preshading on this model, so I painted all the panel lines with dark gray. The pink was originally from the Xtracolor enamel line, but my references indicated that PRU Pink faded quite rapidly to a very pale shade. I lightened up the basic shade a great deal- almost too much- with white and a touch of gray to keep it from looking like cotton candy pink. As it turned out, the dark gray preshading took a lot of pink to cover, and I mostly lost the preshading. I think that most preshading winds up looking like a grid pattern, which in my experience is pretty rare on real aircraft. I prefer to build models as realistically as I can, and that grid effect was not what I was after. After adding a clear acrylic gloss coat to the model, I did my usual panel line washes with artist’s oils, using Payne’s Gray for the major panel lines (flying control surfaces, removable panels such as the engine covers, and so forth), and a much lighter and slightly brownish gray for all the other panel lines. The two pictures I have of MK716 were taken in the fall of 1944. They show a color/tone for the individual aircraft letter “X” similar to the dull red center of the roundels, so I used small dull red letters. There is also a smaller red X under the nose, just behind the spinner. 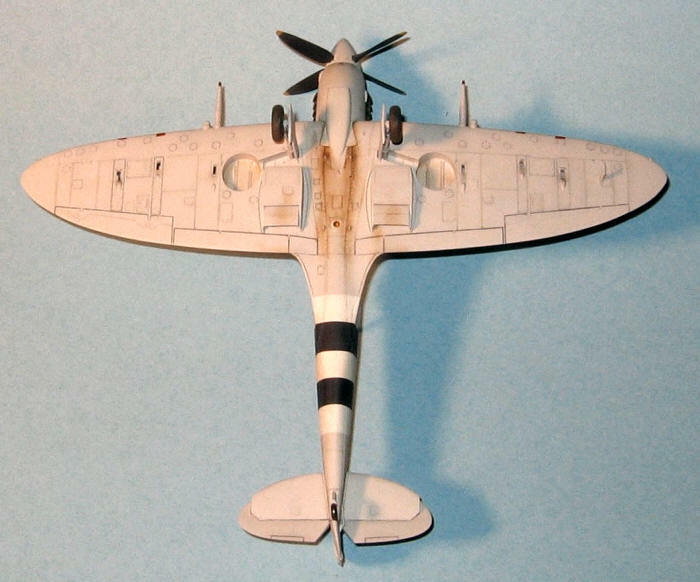 For you Spitfire boffins out there, can you figure out where the spinner came from? 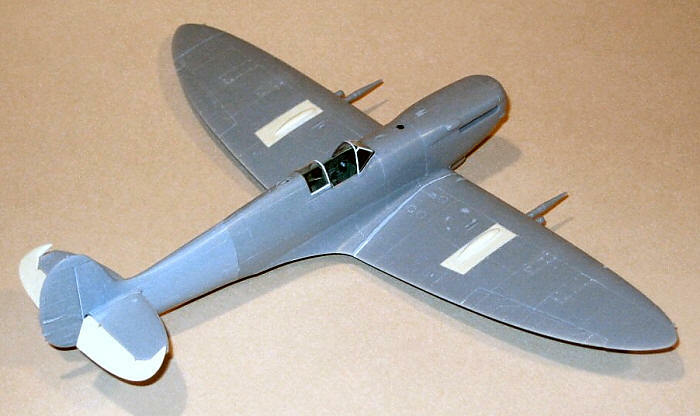 The roundels are standard for the PR/FR Spitfires; 40” diameter ones on the upper wings and 30” ones for the fuselage. The fin flash is cut down from the standard size, and the serial number (unusually) is in very small black characters on the fin, per the available photographs. I used tiny black dry transfer lettering for these. The D-day invasion ID stripes were painted on the lower fuselage only, using off-white and dark gray to simulate worn stripes. They are purposely not perfectly lined up, as was often the case in reality. After partially filling the machine gun openings, I added strips of dull red decal for the red-doped fabric covers, and painted the covers on the cannons (no drilling necessary!). In the following picture you will see a great amount of streaking on the belly of the model. On Spitfires the oil streamed back from the bottom edges of the cowling and was soon covered with a fine layer of dust and dirt. I used oil paints for this, putting just a touch near the bottom rear edges of the cowling and pushing them backward, allowing them to thin out to next to nothing. I added dull silver paint chipping on areas frequently walked on and on the leading edges of wings and tail, as well as some dry brushing to show larger areas of wear. At the end I added a final clear flat acrylic coat, and the silver chipping/wear looks a lot like a light dirt color. Lucky for me I like the effect! I added on the final bits, including Ultracast exhausts and main wheels. Did I mention how much I like Ultracast detail parts? They are outstanding! The exhaust stains were done with very thin Tamiya ‘smoke” acrylic paint, done with the airbrush in several light passes. So now I have two PR Spitfires, both in unusual schemes, and likely a few more to go!